Self-expression is a way of sharing thoughts and ideas with the world that are all your own. Often, settling for an average look or feel becomes commonplace. When it comes to business, the ability to demonstrate valuable differences, one business to another, is what makes your business easily identifiable. All it takes is the willingness to challenge yourself to be who you are. Setting the mental stage for customer expectation is what well-designed reception areas can offer. Take your ideas and turn them into a visual expression of you. The Reno Modern Reception Desk is an outstanding way to blend clean, modern lines and geometric shapes with a natural, rustic feel. 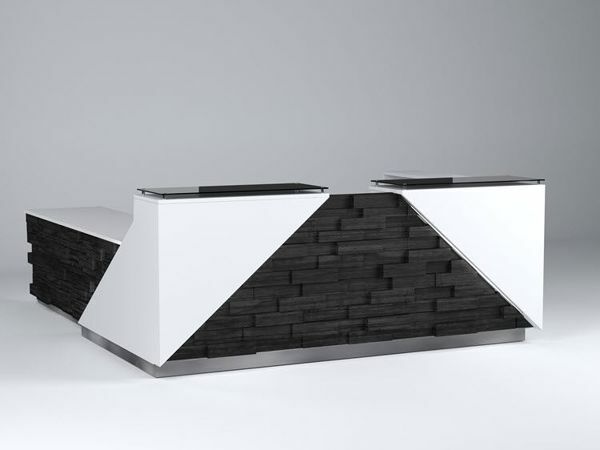 The Reno Reception Desk features a pattern of burnt brick. The slanted end-shapes are done in specialty laminate to emulate a lacquer finish—but are more durable. The transaction top of black glass is suspended above by stainless standoffs. The Reno’s size can be as small as 72" and is available in the best size for your needs. The entry-level return (included) is 36" and can be extended to the perfect size (and side) for your space and usage. Need a color or face-material change? Discuss it with one of our design consultants. The Reno Modern Reception Desk is shown above in white specialty laminate surrounding burnt-brick-patterned wood. The wood is textured and aged in appearance. The desk width is 96" and includes a 48" right-side return. Suspended above the brick are a pair of black glass transaction tops raised by stainless standoffs.